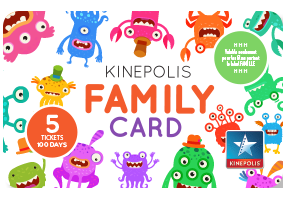 Choose the Kinepolis ‘Family Card’. With this card, benefit from a discount at the bar and pay a special price for all films in the ‘Family’ category. You can recognise them easily by the ‘Family’ logo on the programme or billboard. The staff at our ticket desks will also be happy to help you identify the ‘Family’ films. • The card can be used at ticket machines, manned ticket desks or online. • It contains 5 cinema tickets for all Kinepolis cinemas in Luxembourg, valid for 100 days from the first use (the first use has to be done within 30 days from the date of purchase). • Only valid for ‘Family’ films. • An extra fee will be requested for 3D movies, Cosy Seats and for films lasting 2 hours 15 mins or more and Laser Ultra movies. With the ‘Family Card’, buying tickets online is child’s play. * The Kinepolis ‘Family Card’ costs EUR 43.50. ** 10% off all drinks and snacks – reduction valid until the day after your last ticket used.